In a short span of time, BIGO LIVE has become a great alternative to Facebook Live video streaming feature. BL is easy to use Android and iPhone app with plenty of cool features. The highlighting feature of this application is that it detects your connection speed automatically and sets video resolution accordingly. This feature ensures that the video broadcasting will be smooth. Review: How to use the application? Before you begin using BIGO LIVE, you must log into the app with your Facebook, Google Plus, Twitter account. BIGO enables you to register a new account with your phone number. The last method i.e. self-registration is convenient because the only thing that you’ve to provide is your phone number. The application verifies that the number you’ve inputted belongs to you. To do so, it will send a six-digit verification code to your number. Once you verify the phone number, BIGO LIVE app prompts users to enter a password. Enter a strong password and done! Your account is now ready. Enter the username, birth date. If you want to setup your BIGO LIVE account later, tap on the skip option. The app will now show the top trending video broadcasters on the BIGO LIVE platform. By default, the app will select nine broadcasters so that you can get updates from them whenever they are live. BIGO LIVE lets you deselect the broadcaster. To enter the main window, tap on the done button. On the main UI, you’ll find a list of videos (live broadcast). To watch the broadcast, tap on any video of your choice. When you’re watching a live broadcast, BIGO app lets you send a message to the broadcaster. You can send a virtual gift to them. Users can share the live stream with other users. They can open the profile of the broadcaster and see their location, number of followers, status message, and bio. In case you find the live stream inappropriate, you can report them to the BIGO team. The app provides a special feature called Explore with which you can find interesting people or strangers and follow them. BIGO lets you find broadcasters by their country, gender, or name. It has the option to find your Facebook friends using BIGO. Like the best dating apps, the BIGO LIVE shows visitors nearby you. If your phone has a great front camera, you can become a broadcaster easily with BIGO LIVE application. To do so, tap on the round button positioned at the bottom of the interface and give the app permission to access your selfie camera. Download BL from the Google Play Store or Apple App Store. 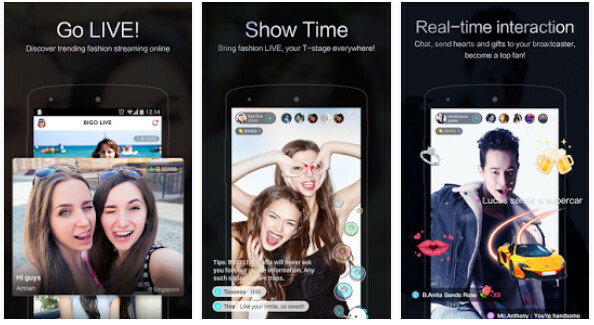 BIGO LIVE is a smart and powerful live video broadcasting application. You can use it for video chatting with friends and finding interesting videos. The application is small and free of errors.